MEXICO CITY, Distrito Federal. Despite a plethora of chances, a first half goal by Carlos Vela was enough for Mexico to overcome an early deficit to play the United States to a 1-1 draw. Michael Bradley (5′) opened the scoring for the Stars and Stripes off a shot from near the center circle that caught Guillermo Ochoa off his line, while Vela (22′) ensured the hosts earned a share of the points. With both sides making significant changes to the teams that played on Thursday, the duel between border rivals opened up with both sides playing a hard tackling game. And from early on in the match, the United States took away many passing lanes to Javier Hernandez and forced Mexico to break attacks more quickly than they would have liked. And off one interception off a Mexico set piece, Michael Bradley caught Guillermo Ochoa off his line with a shot from near the center circle to open the scoring. But El Tri did not change their basic approach and continued to look to find chances on Brad Guzan’s goal. Jonathan Dos Santos could not find the target off a free kick in the game’s thirteenth minute. But on a 22nd minute counter that resulted of a clever play off a deflected shot from Bobby Wood, Carlos Vela brought El Tri level with winding dribble and low finish from outside the area. El Tri looked to use the momentum off their counterattack goal to try to create a goal out of possession against a United States side which closed Mexico attackers down with numbers at every opportunity inside their attacking half. 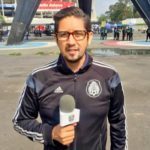 And with the tight defensive approach, El Tri did not get any help from referee Joel Aguilar in the 42nd minute when Geoff Cameron took down ‘Chicharito’ Hernandez inside the penalty area, while the Bayer Leverkeusen strike tried to break in on goal. In the second half, the United States returned to their defensive shell and forced El Tri to try to beat them out of possession. While El Tri were able to pass it around, they found few direct opportunities inside the penalty area to really test Brad Guzan. Mexico’s best chance of the second half to take the lead came in the 70th minute, when Hector Herrera delivered a curling free kick from thirty meters out that beat Brad Guzan, but rang off the crossbar and stayed out of the goal. 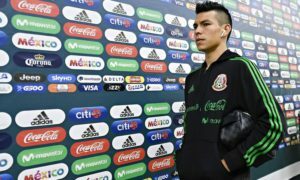 Three minutes later, Hirving Lozano nearly got the lead for Mexico off the boot of Geoff Cameron, when he fired a cross that was deflected by the Stoke City defender in the direction of the goal from inside the penalty area. The visitors had a couple chances late, generated by Christian Pulisic. But the 18-year-old Borussia Dortmund winger could not get his shot on target. And a pass Pulisic made to Darlington Nagbe could not be directed on frame. And in the end, El Tri were left frustrated by the United States’ collective defending and forced to split the points. And as Juan Carlos Osorio left the pitch to give his team a chance to salute the fans, a beer shower thrown by a frustrated fan nearly missed him. 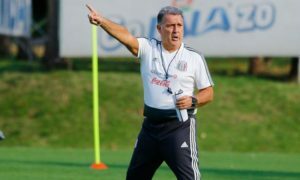 But Osorio’s bigger frustrations have to be that El Tri‘s inability to problem-solve traps in their attacking area and break team defenses down in good goal-scoring positions centrally, a problem that showed up in Mexico’s friendlies, showed up once more. And Marco Fabian picked up a lower leg injury that could be a problem during the Confederations Cup. Ultimately, the draw for El Tri (4-2-0, 14 pts) and the United States (2-2-2, 8 pts), keeps both teams in good position to qualify directly to the 2018 FIFA World Cup. What that will mean in the standings will not be known until Tuesday, when Costa Rica, Honduras, Panama, and Trinidad and Tobago play their matches on Tuesday, April 13. And more importantly, El Tri does not lose any key players due to yellow card suspension for their qualifier against Panama on September 1. 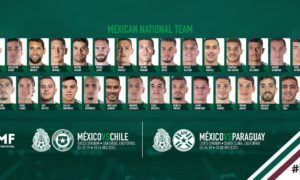 With the June World Cup qualifiers over, El Tri now heads off to Russia for the 2017 FIFA Confederations Cup, and plays UEFA Euro 2016 Champions Portugal on June 18. As for the United States, they return to action in the Gold Cup with a group stage match against Panama on July 8.